Bay Lake Tower at Disney’s Contemporary Resort features breathtaking views of the Walt Disney World Resort. The resort was designed to mimic its iconic predecessor, the Contemporary Resort. Monorail access is just a short walk from the Tower, via the Sky Way Bridge. Bay Lake Tower and the Contemporary Resort are the only hotels within walking distance to Magic Kingdom, the most popular theme park at Walt Disney World. For more information, please see Guide to Bay Lake Tower at Disney's Contemporary Resort. One-Bedroom Vacation Homes feature two full bathrooms and accommodate up to five Guests, plus one child under age three in a crib. Each offers a fully equipped kitchen, king-size bed in the master bedroom, whirlpool tub in the master bathroom, queen-size sleeper sofa, sleeper chair, flat-panel TV, DVD player, washer, dryer and private balcony. Two-Bedroom Vacation Homes feature three full bathrooms. Each features the amenities of a One-Bedroom Vacation Home, plus an additional bedroom with flat-panel TV, DVD player, two queen-size beds and private bathroom. Two-Bedroom Lock-Off Vacation Homes feature three full bathrooms. Each features the amenities of a One-Bedroom Vacation Home, plus an additional bedroom with flat-panel TV, DVD player, queen-size bed, double-size sleeper sofa, and private bathroom. Grand Villas include four full bathrooms and accommodate up to Twelve Guests, plus one child under age three in a crib. First Floor: Features a master suite with king-size bed and flat-panel TV; master bathroom with whirlpool tub; dining area and fully equipped kitchen; laundry area with washer and dryer; and living room with flat-panel TV, DVD player and queen-size sleeper sofa. 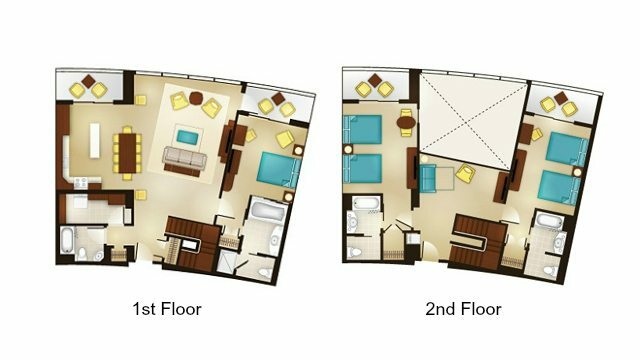 Second Floor: Features two bedrooms each with flat-panel TV, two queen-size beds, separate bathroom, and private balcony and sitting area with double-size sleeper sofa.